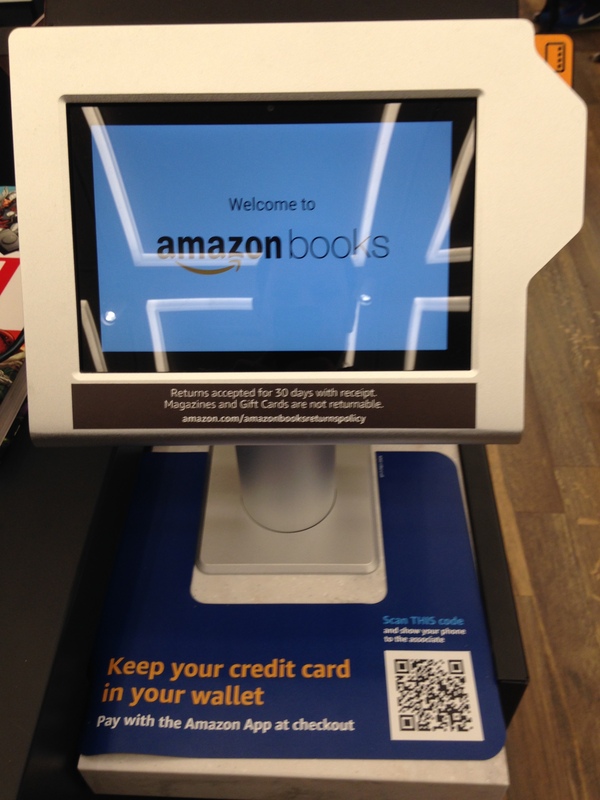 After laying waste to meatspace retail book sellers, Amazon has bizarrely decided to get into the game. Their first NYC store opened over the Memorial Day weekend so I headed down there to check it out. My overall impression: if this was an airport bookstore, it’d be the best of its kind. Considered as a regular bookstore it’s decent-ish, but I doubt I’ll be spending much time there. The store is located in The Shops at Columbus Circle, an upscale mall in the Time Warner Center that also houses a Whole Foods, various luxury fashion retailers, and some of the most expensive restaurants in the city. The store’s space, I’m told, used to house a Borders. It’s on the third floor opposite Thomas Keller’s Bouchon Bakery. The first thing that jumped out at me is that there are relatively few titles for sale and each book is faced. No spines are visible. 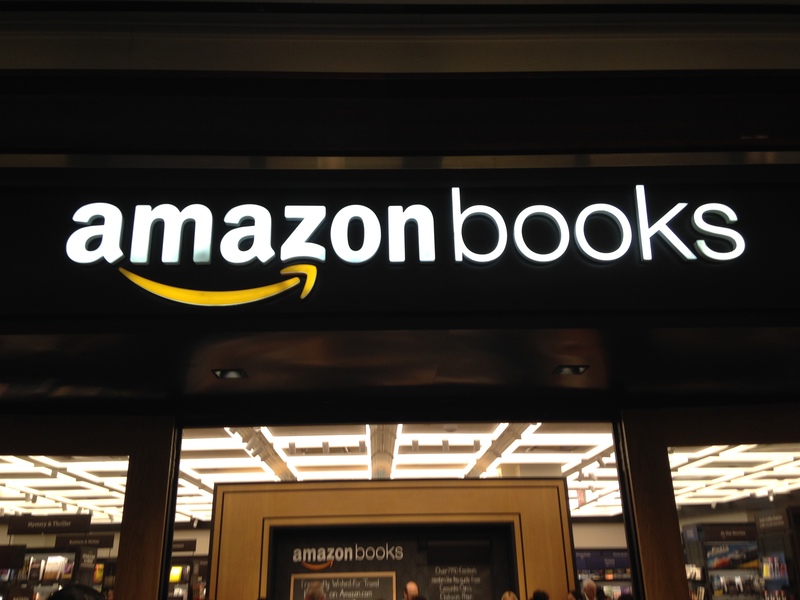 The cumulative effect of the store layout — small stock, Amazon branding, use of reader reviews, and what I think is the Kindle Bookerly typeface for the signage — is a little disorienting. “Wow, am I inside the Internet? Is this how the characters in TRON felt when they first entered the game?” I thought, more than a few times. It quickly becomes apparent that what’s being sold is Amazon’s metrics more than the books themselves. The cost of each book depends on whether you’re an Amazon Prime member. Prime members get the Amazon.com discounted price while everyone else pays retail. There are three or four stations located around the store for you to check the price. As you would expect, numerous Amazon gadgets and higher-end electronics are also on sale. I took the third picture in the series below from an area at the front of the store where the Kindles and Fires are prominently featured. 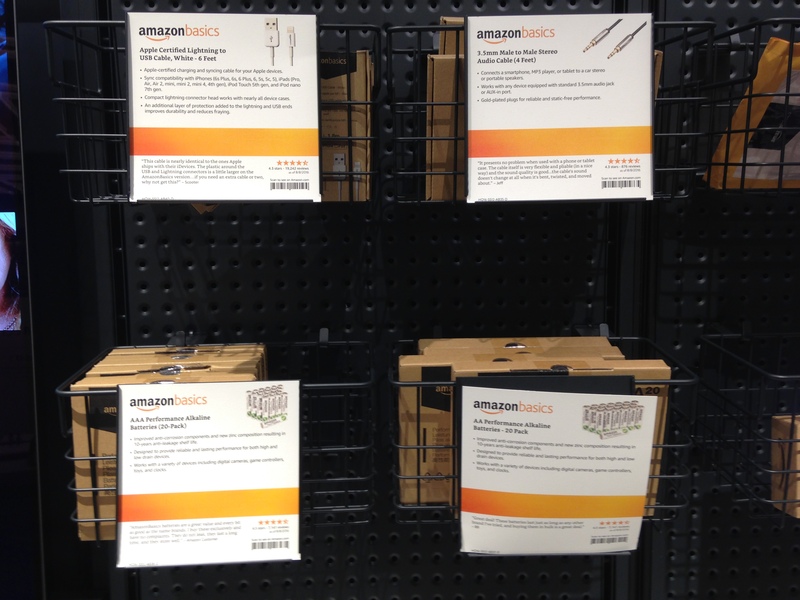 Amazon’s cheapo Basics are also available. A mild attempt is made to give the store a Third Place vibe. 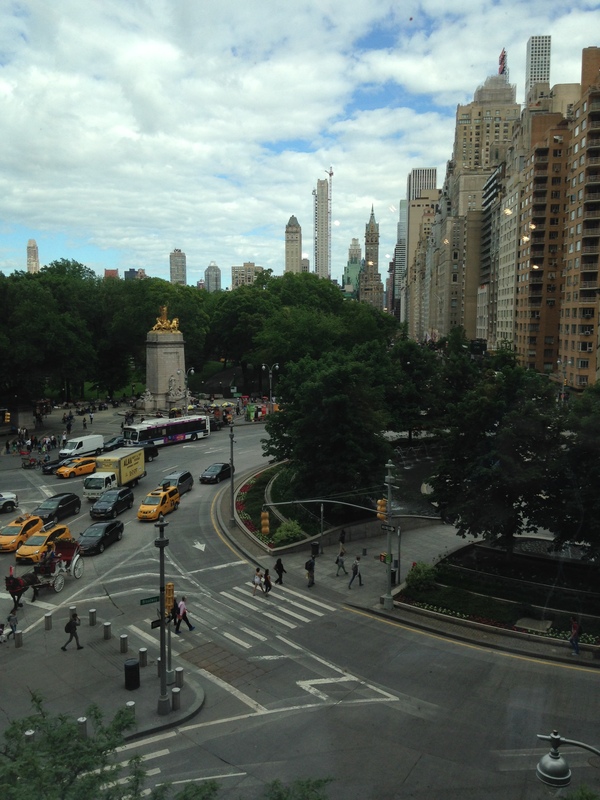 The view from the store of Columbus Circle and Central Park South is pretty nice. 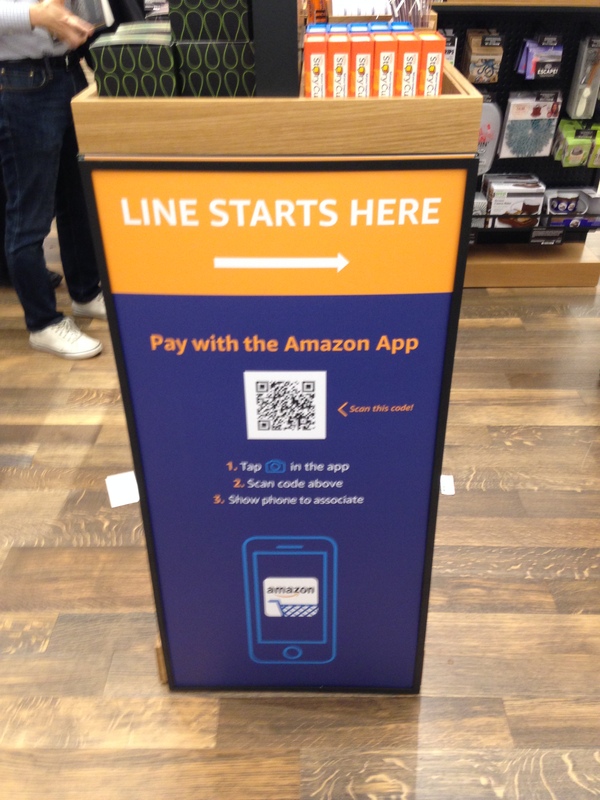 You can pay with the Amazon app, but a friend who tried to do so said it didn’t work. I opted for the regular checkout. There are about six of these stations at the point of sale. I walked up to one and started jabbing my finger at the screen, figuring it was a self-checkout, when one of the employees came over to inform me that I couldn’t use it by myself. When you pay with the credit card connected to your Prime account, you automatically get the Prime price. I’m in the Columbus Circle area a lot, so it’s nice to have a bookstore nearby to browse. Also, sometimes two days is an excruciating amount of time to wait for a purchase to be delivered so, as an American, I’m delighted whenever anyone caters to my need for immediate gratification, particularly when that immediate gratification involves deep discounts. But given that the stock is limited to only very popular titles in a small number of basic categories, I don’t foresee spending much time there. Maybe if I must have the hot bestseller everyone is talking about and don’t feel like waiting for it, then I can see the advantage. Other than that, though, it doesn’t have much to offer me. Which raises the question: What’s the point of this? What does Bezos hope to accomplish? In interviews his representatives have cited books as being part of Amazon’s core identity and others have said the point is to sell Prime subscriptions and Amazon’s various gadgets. Seems reasonable, I guess. But can’t they sell their gadgets anywhere, say Target or Best Buy? How many shoppers are going to go in expecting to pay $20 for a book only to plunk down another $100 for Prime? As for loving books so much, I’d rather they focus on persuading publishers to cut ebook prices, or even get them to bundle ebook versions with hard copies, the way many Blu-rays now include codes for digital downloads. My theory is that Bezos feels guilty about putting book retailers out of business, so these stores are an attempt to atone for that, but given that 1) I know next to nothing about his psychology and 2) there are plenty of other ways to be charitable, I don’t think my theory is any better. As I left the store mulling over these questions, it had become so full that they were holding people back so it wouldn’t get too crowded inside. This entry was posted in Books Publishing and Writing and tagged Amazon, bookstores, Jeff Bezos, New York City. Bookmark the permalink. I don’t know why Bezos is doing this – it was only about a year ago that I was pooh-poohing that Amazon intended to move heavily into the bricks and mortar space – but I really doubt he feels guilty about anything. After having corralled so much of the book trade online, he may want to round up the wandering cattle on the street. I think he is aggressive and leaves little to chance. There’s probably an algorithm or ten that say this is what to do. I think he wants us all to have an Amazon life. I used to be very pro-Amazon and I do like their efficiency. Starting to squint, though, when I look at it now. It’s an experiment of some kind, but what kind? The Borders wasn’t there, it was elsewhere in the mall. 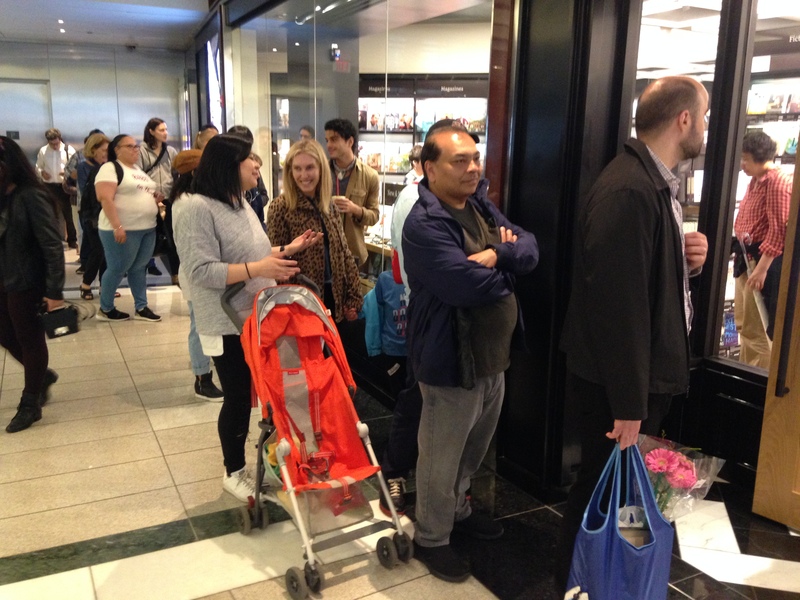 One of the spaces now occupied by H & M. Much bigger, with a separate cafe area. Excellent advertising 24-7 and brings the corporate monster .com Amazon to the streets, to the people.